un-fortunatley this pub has the wrong landlord residing,the past 4 years the tennancy has been up for grabs and no-one wants it,this is due to the fact that the present landlord and his wife and staff have no due consideration for this place,i have been to the premises for the past four years whilst holidaying in towyn throughout the season and the current landlord has nothing special to offer visitors whilst staying at towyn,sometimes their upstairs reasturant opend when they felt like opening it,then during daytimes in high season they had nothing to offer foodwise or entertainment wise to visitors,at the night time every night they constantly had kareokee shows on with the same people singing the same songs night after night! for god sake,remove that landlord and staff and put more merrier landlord and staff in there, its a shame a good place like the seagull pub is being run underground by its present occupants,give me a chance there and i would turn that pub and profits around from low low low,to very high,high,high! 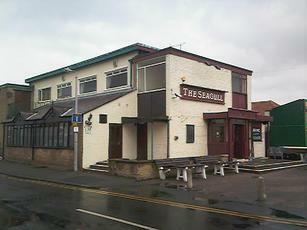 its a waste of a good pub at present! what a shame.